There was an article in this morning’s newspaper discussing how expensive it can be to build awareness through advertising… $340k+ for a 30-second spot on The Big Bang Theory, $600k for a spot on a Fox Network NFL game, $675k – per day – for the universal masthead on YouTube, $200k to be an Instagram advertiser and even $1.5million for a spot during the NCAA March Madness final game. I agree… pretty staggering numbers. Unfortunately, it’s because of articles like this – and sensationalizing the dollars involved – that the overriding perception about advertising is that while potentially a valuable weapon in a firm’s marketing arsenal, it is too expensive for most firms to take advantage of. 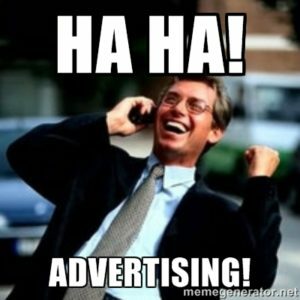 So, before you utter the blanket statement that “advertising is just too expensive,” do a little homework. Look for the right vehicle that focuses on your target audience. Get the stats for reach and frequency. Then ask about cost. In our industry, it’s not nearly as bad as you might think.